While the sports media anxiously awaits to see how Tim Tebow competes on the field, off the field, the Broncos may have already scored a victory against him. You see, Tebow, through his media marketing firm XV Enterprises, LLC (a company named after Tebow's jersey number 15), has filed a number of trademark applications on all things Tebow (like "Tebowing" and "Tim Tebow"). Included in those filings were two trademark applications for GB2. No, this is not Tim Tebow's attempt to compete with RG3's name (although if Tebow did want to, I guess he'd be T2, which would be pretty cool with the whole Terminator 2 reference, but that would likely will run into trademark issues of its own). GB2 actually stands for either "God Bless, Go Broncos" or "Go Broncos, God Bless." Legal translation: The order depends on who is more important to you on Sundays. Well, Tebow is no longer a Bronco. So, this week, XV Enterprises expressly abandoned the GB2 marks, including its GB2 mark for trading cards. Legal translation: As you can see from the below Trademark Office report, the GB2 mark is "DEAD." Description of Mark Color is not claimed as a feature of the mark. The mark consists of The capital letters "GB" with the number "2" in superscript (i.e., GB squared). You can't tell from the filing whether this is a statement by Tebow to the Broncos that "you are now dead to me," or just a business decision (Why have a trademark for a team you don't play for?). But, I'd hazard a guess there's a little bit of both. Although it won't show up in the win-loss column for the Broncos, it is a victory because after this "express abandonment," a Jets player is not the owner of a Bronco trademark registration. On a side note, August has been a busy month for Tebow in front of the Trademark Office. 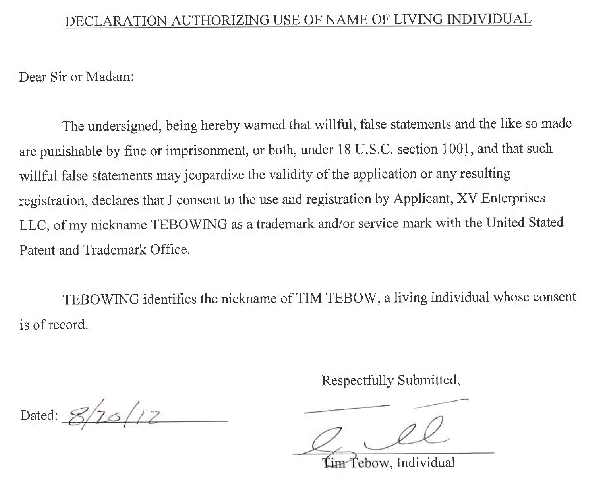 On August 20, he signed a declaration in support of one of his "Tebowing" trademark applications (copy below). Now, I'm putting this filing in here for two reasons. First, this is likely the most-coveted signature of 2012 in the Patent and Trademark Office. I mean, most times all they get is a bunch of egg-head inventors and attorney auotgraphs. I'd be shocked if at some point this filing doesn't become a cut card. Second, I was disappointed that Tebow didn't autograph this declaration with his not-yet-trademarked "15" autograph that populates most of his trading cards. Wait, this one also has GB2 on it! 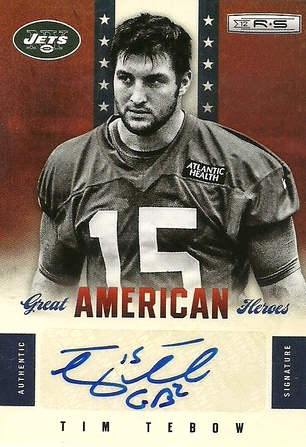 That's got to be a collector's item now, because, I guess you can say, that card is dead to Tim Tebow, too! RIP to GB2, our Trademark of the Week. JOHN ELWAY TIM TEBOW ORTON 2011 TRIPLE THREADS PRIME 3CLR BRONCOS 7X JERSEY 18! TIM TEBOW 2016 PANINI BLACK GOLD COLLEGIATE FLORIDA GATORS HEISMAN INSERT 49!!! 2010 Topps Five Star Dual Rookie Veteran Tim Tebow Drew Brees Autograph 5 RARE!